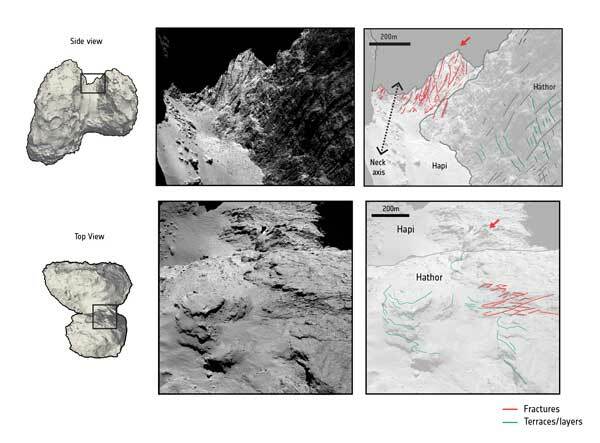 The researchers used stress modelling and three-dimensional analyses of images taken by Rosetta’s high resolution OSIRIS camera to probe the comet’s surface and interior. “We found networks of faults and fractures penetrating 500 metres underground, and stretching out for hundreds of metres,” says lead author Christophe Matonti of Aix-Marseille University, France. The model developed by the researchers found shear stress to peak at the centre of the comet’s ‘neck’, the thinnest part of the comet connecting the two lobes. “It’s as if the material in each hemisphere is pulling and moving apart, contorting the middle part – the neck – and thinning it via the resulting mechanical erosion,” explains co-author Olivier Groussin, also of Aix-Marseille University, France. The observations suggest that the shear stress acted globally over the comet and, crucially, around its neck. The fact that fractures could propagate so deeply into 67P/C-G also confirms that the material making up the interior of the comet is brittle, something that was previously unclear. Sublimation, the process of ices turning to vapour and resulting in comet dust being dragged out into space, is another well-known process that can influence a comet’s appearance over time. In particular, when a comet passes closer to the Sun, it warms up and loses its ices more rapidly – perhaps best visualised in some of the dramatic outbursts captured by Rosetta during its time at Comet 67P/C–G. The new results shed light on how dual-lobe comets have evolved over time. Comets are thought to have formed in the earliest days of the Solar System, and are stored in vast clouds at its outer edges before beginning their journey inwards. It would have been during this initial ‘building’ phase of the Solar System that 67P/C-G got its initial shape. The new study indicates that, even at large distances from the Sun, shear stress would then act over a timescale of billions of years following formation, while sublimation erosion takes over on shorter million-year timescales to continue shaping the comet’s structure – especially in the neck region that was already weakened by shear stress. Excitingly, NASA’s New Horizons probe recently returned images from its flyby of Ultima Thule, a trans-Neptunian object located in the Kuiper belt, a reservoir of comets and other minor bodies at the outskirts of the Solar System. The data revealed that this object also has a dual-lobed shape, even though somewhat flattened with respect to Rosetta’s comet. 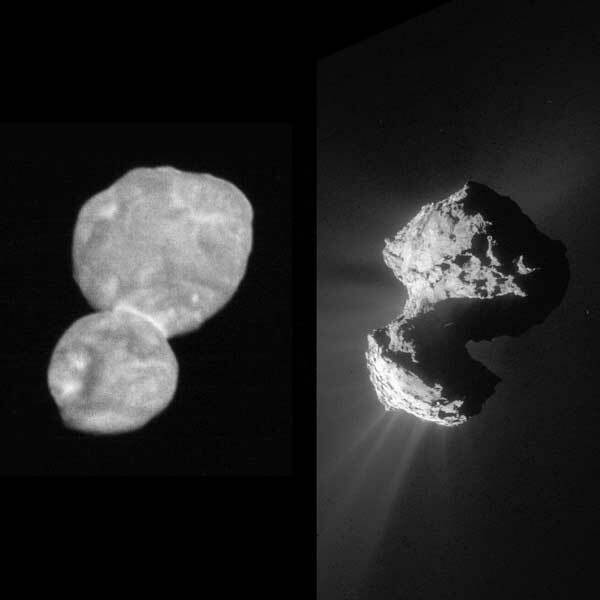 “The similarities in shape are promising, but the same stress structures don’t seem to be apparent in Ultima Thule,” comments Christophe. As more detailed images are returned and analysed, time will tell if it has experienced a similar history to 67P/C-G or not. 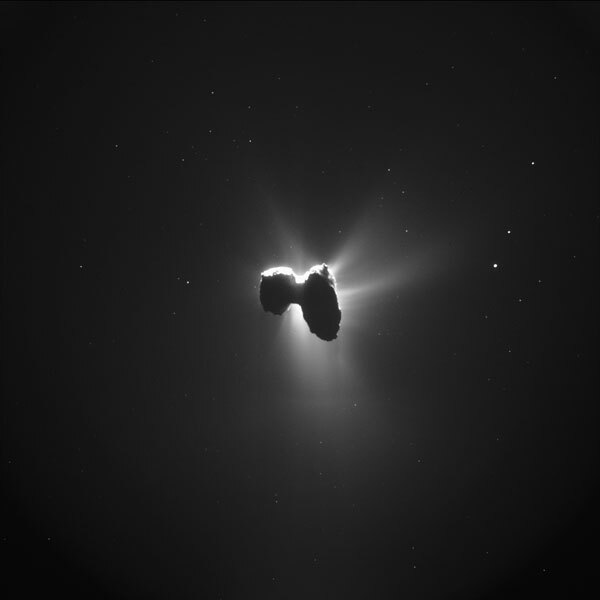 “Comets are crucial tools for learning more about the formation and evolution of the Solar System,” says Matt Taylor, ESA’s Rosetta Project Scientist. “Bilobate comet morphology and internal structure controlled by shear deformation” by C. Matonti et al. is published in Nature Geoscience. Rosetta is an ESA mission. It launched in 2004 and rendezvoused with Comet 67P/Churyumov–Gerasimenko in 2014 to study it close up as it orbited around the Sun. It also deployed the lander Philae onto the comet’s surface. Rosetta completed its mission by descending to the comet on 30 September 2016.